The Watson Pro Pro 14.4V 98Wh Slim High-Load Li-Ion Battery, in a Gold mount, packs many in-demand features into one small package. The battery provides up to a 12A draw, enough for many of the most power-hungry cameras and lights. This high current is offered in a slim form factor that's suitable for gimbal, stabilizer, and drone applications. The battery has both D-Tap and USB outputs for powering accessories and charging mobile devices simultaneously with your main load. The 98Wh capacity provides approximately 2.5 hours of runtime for a load of 35W. A 5-LED gauge on the side indicates remaining battery life at the press of a button below the LEDs. When capacity drops under 9%, the bottom LED automatically begins blinking as a warning. For safety, built-in intelligent circuitry shuts down the battery in case of high current, low voltage, extreme temperatures, or possible short circuits. In this way, both the battery and your gear are protected. Ergonomic grips on the sides of the battery allow for more comfortable handling while also enhancing the look and feel of the battery. The ergonomics blend well with the slim design of the AM-98-SHL. 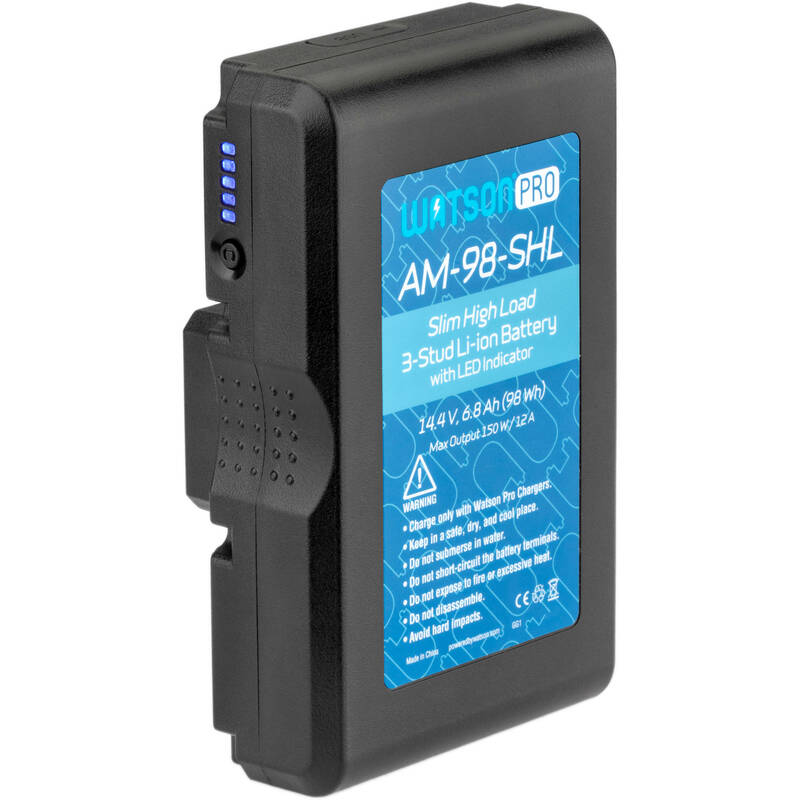 The AM-98-SHL is rechargeable using any Watson Pro Gold mount charger. Box Dimensions (LxWxH) 7.5 x 4.9 x 3.4"